In a recent Premium Alert (subscription required), we reported Fairfield Financial Mortgage Group Inc. was involved in ongoing hearings in response to a Cease & Desist order from the State of Connecticut dated 2008-10-20. We have since learned that Fairfield Financial Mortgage Group Inc. surrendered their license on 2008-11-14 per Nancy Wawruck with the Connecticut Department of Banking. We spoke briefly with former President and founder of Fairfield Financial Mortgage Group, Charles Levesque, who indicated "it's more of a story than that," but could not be reached for further comment. Fairfield Financial Mortgage Group was fined $15,000 by the State in June of 2007 in a Settlement Agreement for failing to disclose a "silent second" they extended to an employee in conjunction with a first mortgage loan made by BNC Mortgage. The agreement required they submit semi-annual audit reports of their compliance with the agreement, and the current C&D holds that they failed to do so. The company is also named as a defendant in other ongoing litigation involving alleged TILA violations and predatory lending (documents available via PACER - the Public Access to Court Electronic Records system). The Fairfield Financial Mortgage Group web site is still working as of 2009-01-15, and the main office phones are now being answered "President's First." The person who answered the phone confirmed Fairfield Financial Mortgage Group had "merged with" President's First Mortgage Bankers effective 2009-01-01, and was operating from the same location at 2 National Place in Danbury, CT. President's First Mortgage Bankers is a retail and wholesale lender and a dba of Franklin First Financial licensed in CT under numbers FMCL 8170 and FMCL 8171 per the interactive map on their web site (archived copy here). 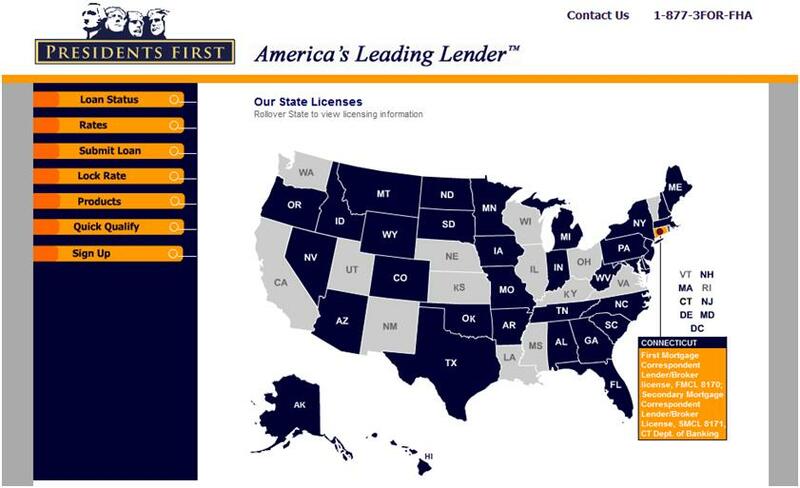 The Connecticut Department of Banking told us there were "no licensed locations for Franklin First Financial dba President's First Mortgage Bankers in Danbury." Attempts to reach other former Fairfield Financial branches were unsuccessful. Fairfield Financial Mortgage Group was licensed in 18 states primarily in the eastern U.S. and averaged about $17.5 million in overall volume for 2007, a drop from the $21.4 million averaged in 2006. Email reports indicate they averaged between $15 and $20 million per month in 2008. A source familiar with the company told us an additional $5 to $8 million per month was originated from their retail branches. CityTownInfo reflects four offices in CT, PA, TX and FL. Fairfield Financial Mortgage Group is still listed as an approved lender by HUD as of 2009-01-15, with a fifth location in Rancho Cucamonga, CA. A company profile posted on BusinessWeek also indicated a branch in Massachusetts, and public records reference an additional retail branch in Uniondale, NY. Manta reports the company had 60 employees. Please feel free to contact us if you can provide additonal information on this company. You can also post your comments below.